A friend of mine from high school contacted me via facebook back in February about moving to Nashville. She had several places in mind in North Carolina but was also considering Tennessee. She was interested in hearing our thoughts on Nashville since we had recently relocated here. After a few e-mails and phone calls we reunited downtown at Tootsies over a few cold drinks and some good music and caught up over the past two decades (ahem, +). After visiting North Carolina and looking at employment options, etc., our new/old friend e-mailed to let us know she had decided to move to Nashville. We were thrilled! Once she got here, I showed her some of the sights in Nashville. Since I had to pick up hog casings for sausage so I could make my June Charcutepalooza submission, one of the places we visited was the Butcher Supply store. It was quite the adventure. Our new/old friend has read our blog and was intrigued by the Charcuterie challenge along with the recipes and the farm food. Since the sausage stuffing challenge was due on the 15th, we invited her to help us with the sausage making last Sunday, June 12th. We started the afternoon off with a farm fresh shaved (we used a potato peeler but a mandolin would be better) beet salad, mixed with fresh squeezed lemon (or lime) juice and chopped parsley, a palate cleanser and supposedly a precursor to the evening. This salad is simple and delicious. 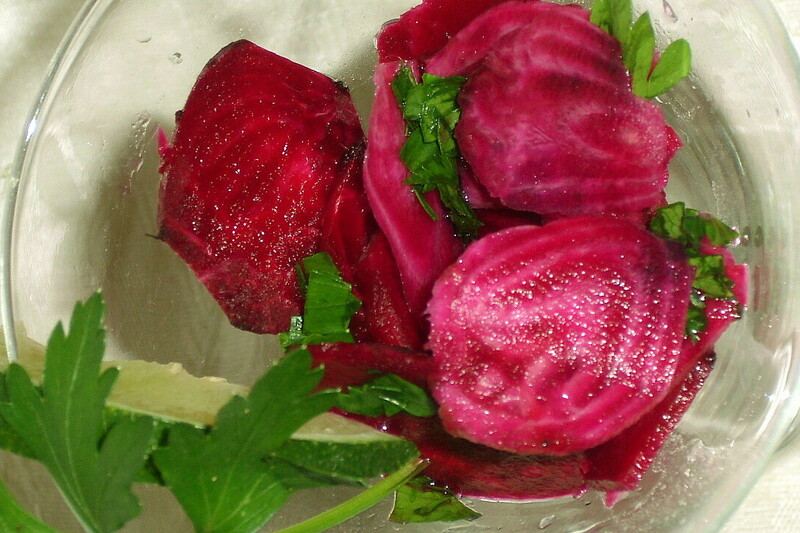 A customer who bought some beets from our farm gave me this recipe last summer. It’s one of our favorite starters. We had all kinds of plans including making pesto (which we accomplished) and subsequently the chicken pesto sausage (left for later), having a light lunch at home and then heading out to one of our favorite people watching venue’s, Puckett’s in Leipers Fork then back to the farm for dinner. Well, the conversation and people watching was incredible and the day got away from us. When we finally got back to the farm from Puckett’s we had not started the chicken part of the sausage and dinner was not (even close to being) ready. However, we all pooled our skills and rolled back our sleeves to stuff sausage for the first time (even with a key component missing on the stuffer). This was a big mistake and the end product was a colossal failure. Instead we made a pasta sauce with the ground chicken and pesto mixture and had a late chicken pesto pasta dinner. It had wonderful flavor. Cut the white and dark meat off of 2 (*humanely raised) chickens leaving the wings on the carcasses(save the carcasses for making soup later) put the boneless meat in a plastic bag in the freezer for at least a half an hour, you will want it almost frozen. Soak casings for the amount of time specified on the package. Run the chicken meat through the meat grinder and mix with the pesto. 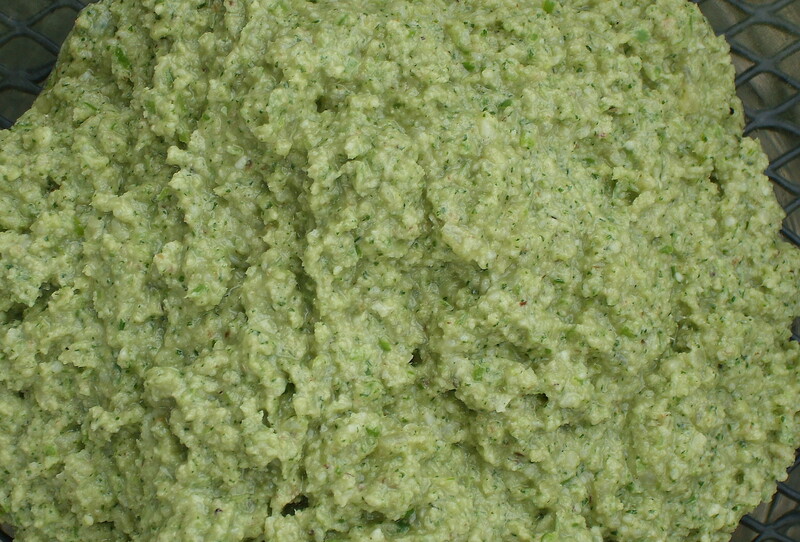 Run the meat/pesto mixture through the grinder again to make sure it is completely mixed with the pesto. Remove the extruding piece from the grinder and add the stuffing arm (we have a manual grinder). Make sure the stuffing arm has been sprayed with oil per Mrs. Wheelbarrows post about stuffing sausage…very important. Stuff sausages and cook or freeze, they will keep in the fridge, but only for a few days. We decided to cook our sausages on a roasting pan in the oven at 400 degrees for 30 minutes (or until done). To accompany our sausages, we looked to the garden. Garlic, beet greens and parsley appeared gorgeous and tasty, all perfectly fresh. We also had some left over cooked chickpeas from making homemade hummus a few days ago. 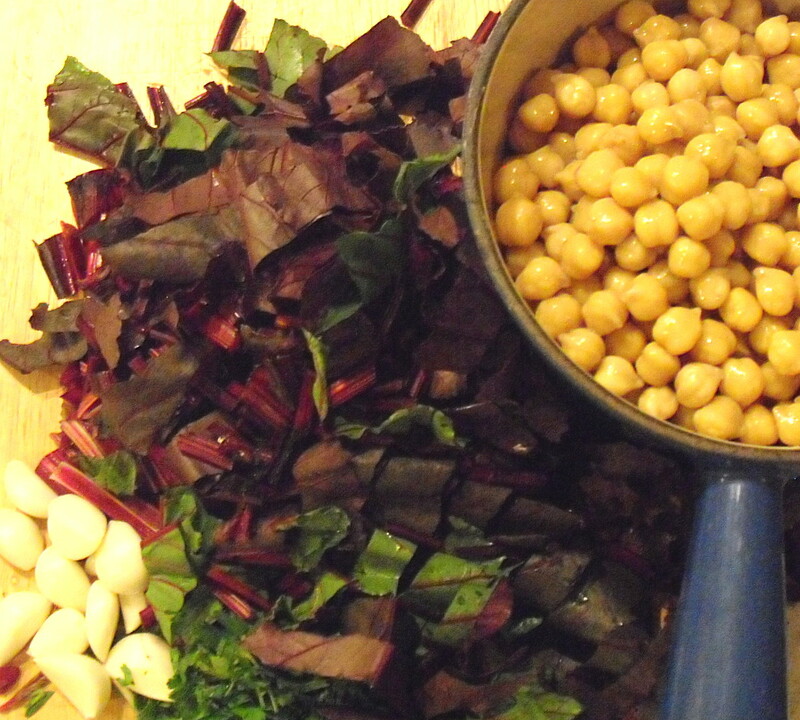 Beet greens and chick peas. Saute greens, garlic and parsley over medium high heat in oil until wilted (about 3-5 minutes) add chickpeas, mustard and season with salt and pepper to taste. 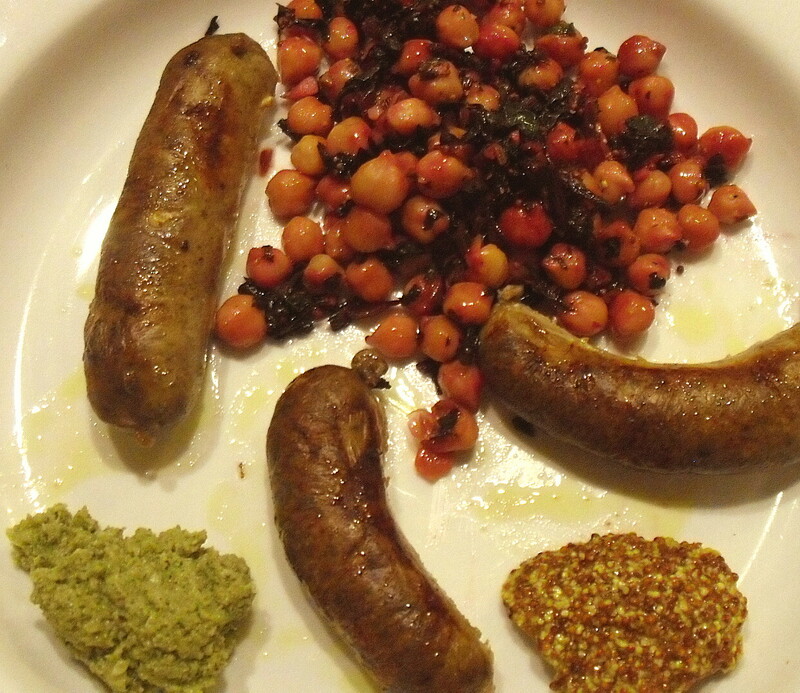 Serve sausages and chickpea/greens with a dollop of whole grain dijon mustard and if there is any leftover pesto, add that to the plate as well. Though the pictures don’t do it justice, it was incredible. 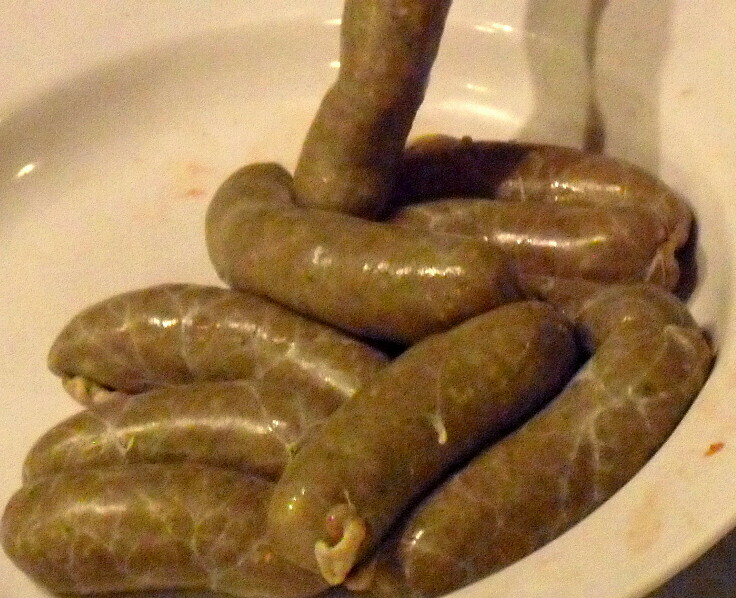 Our new/old friend was not with us to enjoy the successfully completed chicken pesto sausages… however, there are some in the freezer for next time we see her! *We know beyond a shadow of a doubt that these chickens enjoyed life in all the chicken ways that chickens will – given the opportunity to range completely without constraint on pasture and in the woods (with the protection of Livestock Guard Dogs). And when it came time to grace our table, the end was quiet, calm and a sincere apology was offered. This is the most humane end we currently know of. If there is a better way, we’ll find it, as the processing of a chicken is no fun for anyone. How do we know these chickens enjoyed this life and met this described end? We raised them and we processed them ourselves.